Should I sit straight, lie down, breathe, listen to music? Am I doing it right? Am I doing it long enough? There goes the mind again, busy, busy, busy! These were my thoughts twenty years ago, before I discovered meditative music, and meditation. However, in my mind, they were separate, like apples and oranges. Before I started playing the bowls, my idea of meditation was taking a walk in the woods or a hike up a mountain. It was a word I had heard over and over again, but the visceral concept eluded me. Music was for joy, and meditation was to relieve stress. In my mind they were separate. It was not until I heard the quartz crystal singing bowls during a transformative time in my life (at a workshop in Bayfield, Colorado, USA) that it dawned on me something very profound was happening to my body, mind and spirit. Words escaped the experience. A space was created, and I just wanted to be in that space. My happiest moments were when I was playing the bowls, giving a private session or singing with the bowls, because I was transported to a place inside that I had been looking for all of my life, and yet did not know it. It also gave me a profound connection to the person or persons I was playing for. There was a silent conversation taking place, where there was a wordless bond within the sound where all was revealed in the sweetness of being. I had discovered the joy of unity through the sound. I was not in charge. My job was to follow the music, to follow the sound, observe, and be in the field with humility and reverence, because it was not me that was doing this. I was not conducting; I was being conducted.That began the journey of sound healing, sound and music that can help release old patterns, emotions, and fill the body with benevolent vibration. Now, flash back to China five years ago. A dear friend of mine calls, and asks if I would be interested in going to China to play the bowls for a group of meditation practitioners at a Zen Buddhist Retreat Center in Shaoxing. It seems the Shifu there was a modern-thinking nun, who felt being immersed in sacred sound could help her students be better meditators.This invitation could not have happened without Rita Chao agreeing to go on the trip with me. This was a huge undertaking, and I was grateful for all of the organizing Rita was doing, going back and forth with emails and communications. Many people made this happen. It was surreal, and somehow I could feel it was important. I was about to embark on a journey that would change my life, and hopefully support others on their path. It was like all sound classes held in Taipei Lapis Lazuli Light. Once the bowls arrived on the scene, I discovered there is no separation between healing and meditation. They are two different radio stations in the radio band of life. when we listen to the radio, we are literally tuning into a frequency. Both of these “broadcasts” lead to raising consciousness, and both help us heal. In fact you cannot heal without raising consciousness, as there literally is no separation. Raising consciousness allows us to make better choices, and hopefully one of those choices is to meditate more.It is now my fifth year of making this pilgrimage to China. It has been very humbling how much I have learned from the meditation practitioners in China. I would like to share with you what I have learned by utilizing the quartz crystal singing bowls for meditation, as well as the Tibetan brass bowls. They have created a marriage of not only spaciousness and harmony, but also clearing karma and accessing the Higher Mind. Please pour yourself a cup of tea, and lets have a share. There are a couple different ways to play the bowls to support meditation. Normally when people sit down to meditate, at first the mind is busy. There is a brainwave called the beta brainwave, that when our brain is mostly sending out those signals, we are not conscious of our body, only our thoughts. Imagine that you are driving down the road, looking at the oncoming traffic light. You are not feeling your hands on the wheel. You are most likely thinking about whether you will make the traffic light. Your consciousness is fixed on the external world. When we begin meditating, that is when we start to feel the sensations of our physical body. We feel our feet, or our hands resting on our knees. We begin to slow the brain states. The first sign of slowing down is to feel the sensation of your physical body and still be aware of the external world. In the world of sound, we call that accessing the Alpha brain waves. This is a good place to be when beginning to meditate. Crystal singing bowl sounds that support that can be a melody, to play something the mind can follow. So when I would begin a session, I would play the bowls in a similar way one would play the piano. The left hand carries the bass, or lower notes, and the right hand carries the melody. In sound, it is very similar. I would play a very low noted bowl to allow for all of the harmonic overtones to be heard AND felt. A lower note bowl carries all of the overtones, from low to high. A medium toned bowl carries medium to high harmonic overtones, and a higher note bowl carries only the higher harmonic overtones. In sound healing and meditation, when we have at least one lower note, then we can access all of the overtones, and also have more sensate feeling in our body. It is much easier to reach emptiness if we can feel our physical body first. That gives us a foundation to reach higher states of consciousness. Besides playing the lower notes, I would then play a higher melody to give the practitioners something to listen to as they began the meditation. Mid and higher melodic interludes can help calm busy minds. If a busy mind has a melody to listen to, then they will start to entrain with that melody, allowing the brain states to start to slow down, because they are no longer in a beta brain state. They are being carried by the sound. After ten to twelve minutes of this kind of sound, the brain states start slowing up enough to be able to access the magic window of not just alpha brain waves, but also theta. You can think of theta brain waves as not being aware of your physical body anymore, but being in more of a dream state, being aware of only the internal world of the meditator. The experience inside the person becomes so real that they are only aware of this. This is actually the brain state where people do their self healing. It is very important. My experience in observing people meditating is when they listen to the bowls, and the harmonic overtones of the bowls start dancing between each other, the person can feel more space. The notes start to fall away, they go into slower brain states. They start to slow their respiration, heart rate. they stop thinking about the aches and pains in their body in a lotus position, and they go into emptiness. Now, this does not happen overnight. Many meditators have discovered a great secret. Sitting perfectly still actually burns up karma. This is why some people will come to a week-long retreat, and will have a sprained ankle at the beginning, but will be completely healed after spending so much time completely still in meditation. This is a great example of how there is no separation between healing and meditation. Usually the first three days, there is a lot of physical clearing going on. People can feel their breath smells, or there is more body odor. They are doing so much meditation that they are detoxing, and not just physically, but emotionally. There is no difference really between thoughts and emotions, and this becomes more apparent when someone is doing hours and hours of meditation a day. So the quartz crystal bowls soften this journey. They give the meditator a place to rest the mind. Once they become more comfortable being in this space, the bowls fall away from the mind, and it is much easier to reach the spaciousness of meditation. The other beautiful part of the the quartz crystal singing bowls is they add beauty and music to the equation of meditation. Beauty heals, and sometimes just listening to these sounds, the Higher Mind is given permission to download more of our Divinity into the physical form. Enlightenment is a very physical process. It is not just about the mind. The physical body is part of the equation. Music, sound, vibration, and frequency are all tools that the Higher Mind utilizes for a human being to have this experience. Let’s touch in on how the Tibetan brass bowls also support a more refined, deeper meditation. One purpose is they are almost like vacuum cleaners for the heart when the vibration can be felt. I have seen tibetan bowls help open the heart through just the sheer vibration. Sometimes people can have their heart closed unconsciously. They are doing it because they do not want to get hurt. However, when the heart is shut down, the negative things may not be able to enter the physical heart or the heart chakra, but the benevolent things also cannot get in. For most people, the diameter of the electromagnetic field of the heart is six feet. When the sound can interface with the etheric field of the heart, expansion can occur in a very healing way. So I see the brass bowls as a way to have the vibration enter the etheric field and also the physical body. It is important to remember the physical body does not say, “I am happy, I am sad. “ The physical body says, “I am cold, I am hot, I am prickly, I am numb.” The physical body registers emotion through sensate experience. 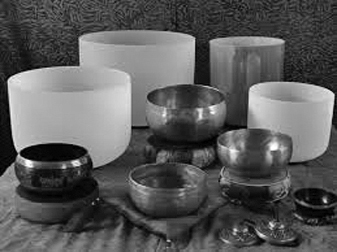 The vibration of the Tibetan brass bowls is a profoundly powerful way of having sacred sound enter the body and bioenergic field (the aura) through vibration. So subtle, yet so powerful. The other gift of the Tibetan brass bowls is the divinity they carry through vibration. If you have a being with high consciousness create or make a bowl, that consciousness is literally inside the bowl. This is why when I purchase a brass bowl, I like to know who made it, because when a bowl is made and blessed when it is created, there are energies or fields of consciousness that continue to work with the bowl. This is why not all bowls are created equally. So, the brass bowl can be gently tapped, and even if the meditator cannot hear the sound emanating from the bowl, they can feel the vibration.The skin is the largest organ in the human body. Vibration is translated through the skin. There is a great marriage of harmony and resonance when both types of these bowls are played together. The Tibetan brass bowls require some space. You do not want to keep tapping on a brass bowl over and over again. The space is part of the music. It is part of the song, just like any song you would hear on the radio. We need that space, and that is the gift of the Tibetan brass bowl. The Tibetan bowl mirrors our intention of creating spaciousness with the sound and meditation. When the crystal and brass bowls are played in concert with each other, just like a piano, we have the notes, the music, the sound, the frequency, and the dance of these harmonic overtones together, playing the music back to the minds and hearts of the meditation practitioners.To play these quietly, and even more quietly when people go into deeper meditation, can be benevolently helpful. It has been very humbling to learn so much from watching and playing for people dedicated to being on the Path. I do not think it is possible to live in this world at this time and not do some form of meditation. The world still carries chaos and suffering. Our mission as humans and spiritual beings is to learn to let go of this programming. Meditation and sound will become increasingly more important for creating a life of peace, harmony and blessings. I hope you have enjoyed this cup of tea and sharing with me. It has truly been my honor. I look forward to seeing you in Taiwan this fall.